I love watching these amazing aviators outside our window. They are precision fliers that work in teams to capture bugs and they also love to come and enjoy the service berries in our yard. A very social bird, they rarely are seen alone, and have even been known to pass berries from beak to beak to make sure every bird gets something to eat! 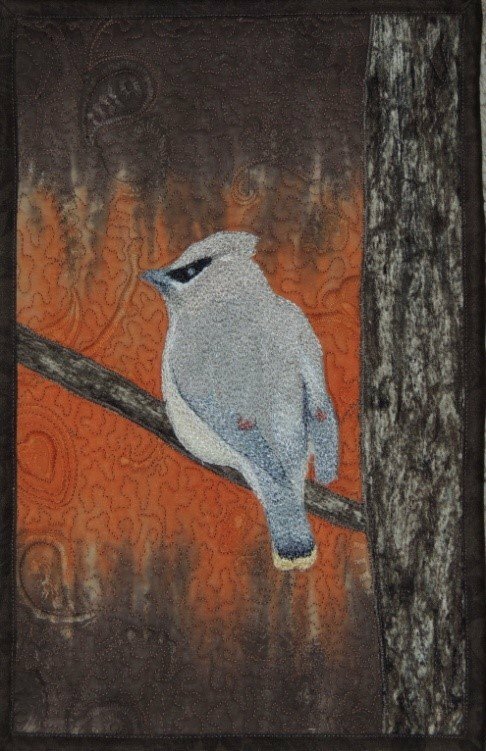 The bird was created entirely with thread and then appliquéd, along with the tree and branch onto an embroidered background. As fabric will fade if put in direct sunlight, it is best not to hang this piece where it will receive full exposure to the sun every day. Do not launder this piece, but dust lightly or spot clean if needed. For travel, rather than folding, it is best to gently roll.